(Newser) – Sen. Tammy Duckworth and daughter Maile have made Senate history, the AP reports. The Illinois Democrat brought her daughter, in a pink hat, onto the Senate floor Thursday under new rules that permitted it. Duckworth already is the only senator to have given birth while serving in the Senate. Maile, born April 9, is the first senator's baby to be allowed on the chamber floor. The history was made under a new rule passed a day earlier that permitted newborns of senators on the floor during votes. The Daily Beast says the vote was to confirm Jim Bridenstine as NASA administrator. 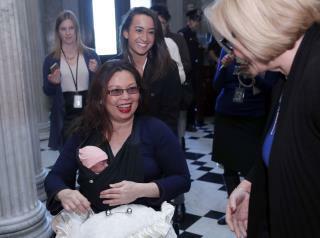 How ridiculous to bring a newborn on Senate Floor for any reason. She could have hired a baby sitter like any sane person would have done but the democrats have to get attention some way or another.!!! Just when you thought the stench from the democrat side of the isle couldn't get any worse. "..with Maile on her lap, voted no with a downturned thumb, and laughed." Other than the fact that she's just another senate clown, this story has no legs.